According to a study published by chartsbin.com in 2011, Greece, unlike its small size, ranked 15 among all the countries of the world, with 5,5 kg of annual coffee consumption per capita. But drinking coffee in Greece is not just a habit. It is a daily ritual that you can enjoy alone while reading a newspaper or with friends in a busy cafe, in the summer outdoors next to the sea, during winter in a cozy saloon or on a roadtrip. Coffee breaks in Greece are serious affairs and last long. So long that the best ideas were born over a table with some cups of coffee, some friends or colleagues and brainstorming. When one person wants to ask another one out they say "Would you like to go out for a coffee with me?". Sharing a cup of coffee can be a pastime for friends and a pretext for flirting, catching up on the day's news or even playing chess and backgammon. Coffee is a vital part of the Greek culture and it is remarkable, yet not surprising, that Greek cafés are mushrooming instead of loosing ground from the big international coffee chains that have opened in Greece. 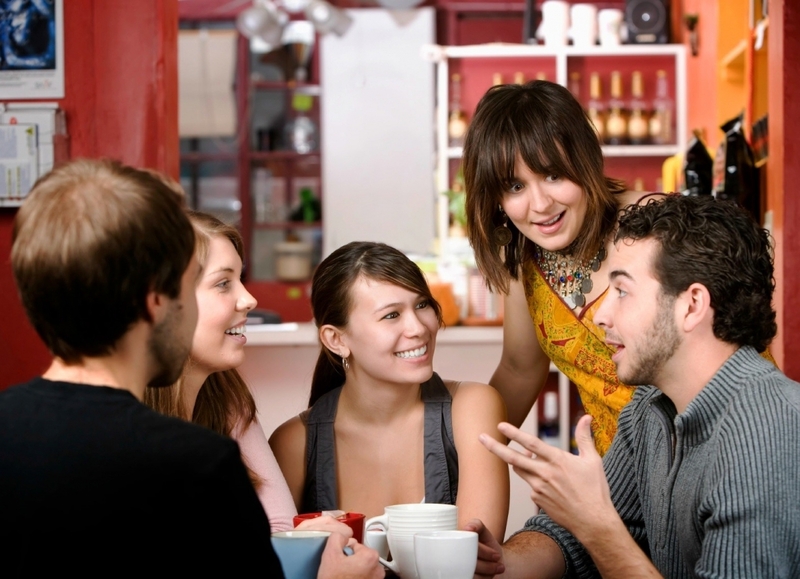 The country is littered with local cafés, which in Greece can take two forms. The first form is a kafeteria. 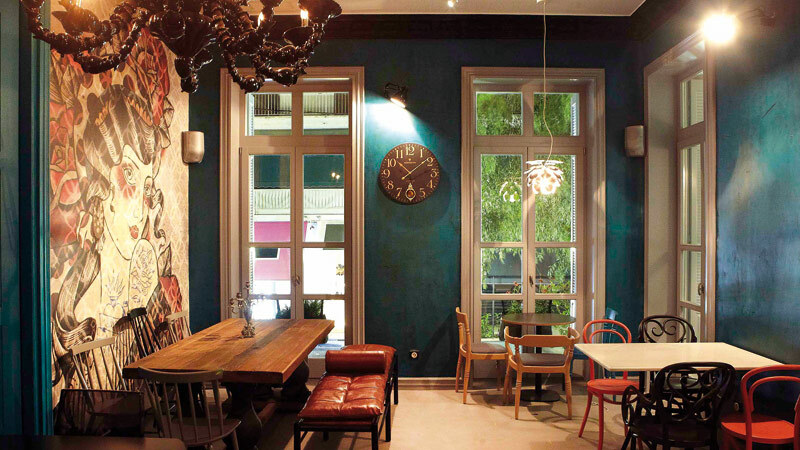 A kafeteria is as a quite trendy and popular hangout for Greeks, gathering especially people under 35 years old. During spring and summer most of the kafeterias provide outdoor tables and also serve as bars at night. A kafeteria usually offers many types of coffees, other beverages and snacks. 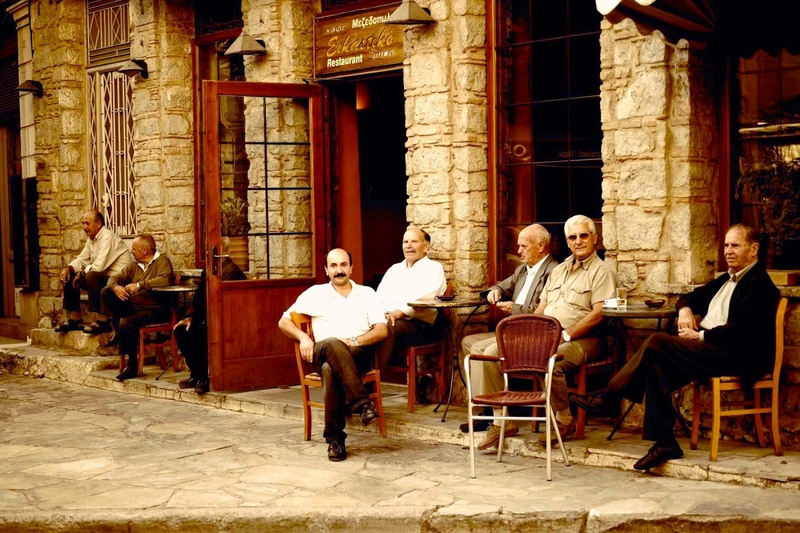 The other type of Greek cafe is the "kafeneio", the old traditional café that existed decades before and used to be and still is the meeting point of the elderly men in every village or town, though everyone is welcome and treated courteously. But wherever you choose to sit, by the time you open the catalog and look at the coffee section there are some standard coffees that you will probably meet. 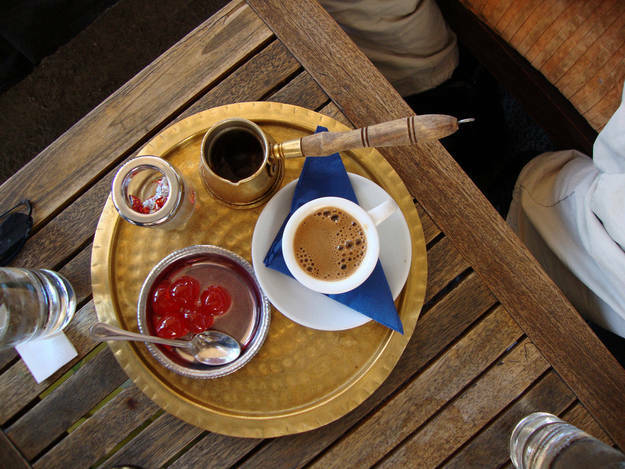 To begin with, the traditional Greek coffee, also known as "ellinikós kafés", is a brew similar in consistency to American instant coffee and is actually a version of the Turkish coffee, as it made its way to Greece during the Ottoman occupation. It is a thick, strong, black coffee prepared in a special small pot called a "briki" and served with a unique foam on top and the grounds in the bottom of a small cup. The small size of the cup does not imply that the coffee is meant to be drunk as a shot. 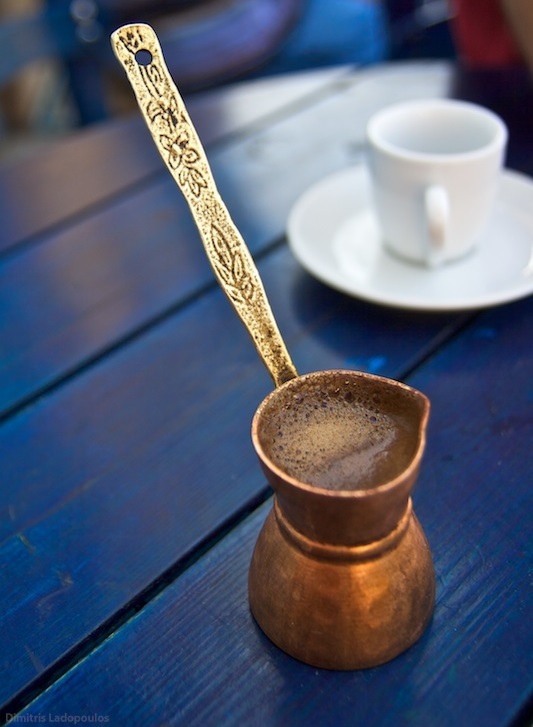 Instead it is meant to be sipped slowly, fitting perfectly with the Greek coffee culture. The grounds settled at the bottom are not for consumption. These grounds form a sediment that has given birth to the Greek custom of fortune telling. According to the custom, after finishing your cup of coffee, you have to revolve the cup so that the sediment covers all the inside area, place the saucer on top of the cup, turn it upside down and patiently wait for the grounds to drain out of the cup. 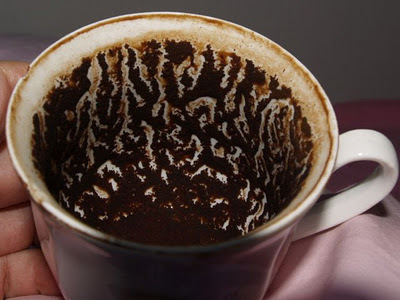 Then someone else has to peer into your cup and interpret for you the shapes and forms that the chalky residue takes. Other superstitions around Greek coffee have to do with spilling a little out of the cup, which is concerned to bring luck and money. Also, if your cup of coffee has a big bubble some say it betokens disappointment while others believe it means that a good friend will arrive soon. 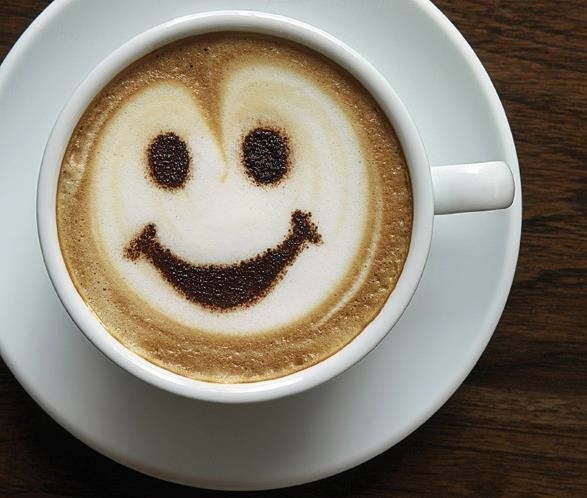 A cup of coffee is supposed predict the weather. If bubbles gather in the middle of the cup's surface, then the weather will be sunny and nice. If bubbles form around the outside of the cup, the weather will be changing to rain or snow. But it seems that some superstitions have a bit of physics involved in them. In this case the high atmospheric pressure, which usually comes with a sunny fair weather, forces the bubbles on the surface to go to the center of the cup. At low pressure, which according to physics can lead to rain or snow and predicts a change in the weather, the bubbles burst to the outside of the cup. In Greece, brewing the ideal cup of Greek coffee is an art form and the first properly made cup of Greek coffee is a sign of maturity for a girl. 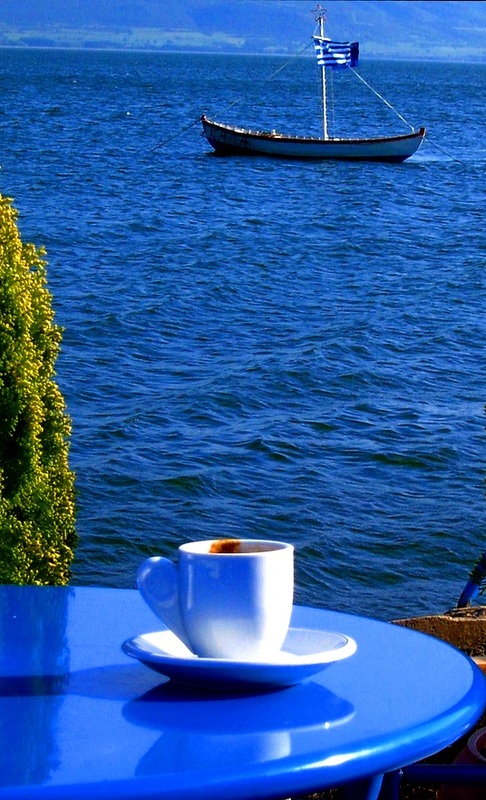 In Greece, when you order your cup of coffee you also define the degree of sweetness you desire. A special vocabulary exists just for this. So in the case of the traditional Greek coffee, the most common variants are "sketos" (without sugar), "metrios" (with a tsp. of sugar), "glykos" (sweet, with 2 tsp. of sugar) or "variglykos" (very sweet). 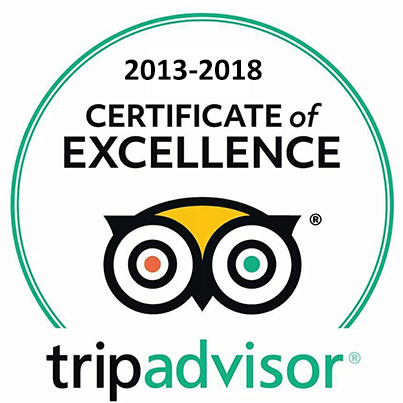 If you don't specify it, the coffee is usually served moderate to sweet and that is preferable because without any sugar and due to its strong flavor it has a quite bitter taste. Greek coffee is still served in most coffee places but traditionally prepared can be found in less popular cafes as a lot of the modern venues tend to use espresso machines, compromising on quality. 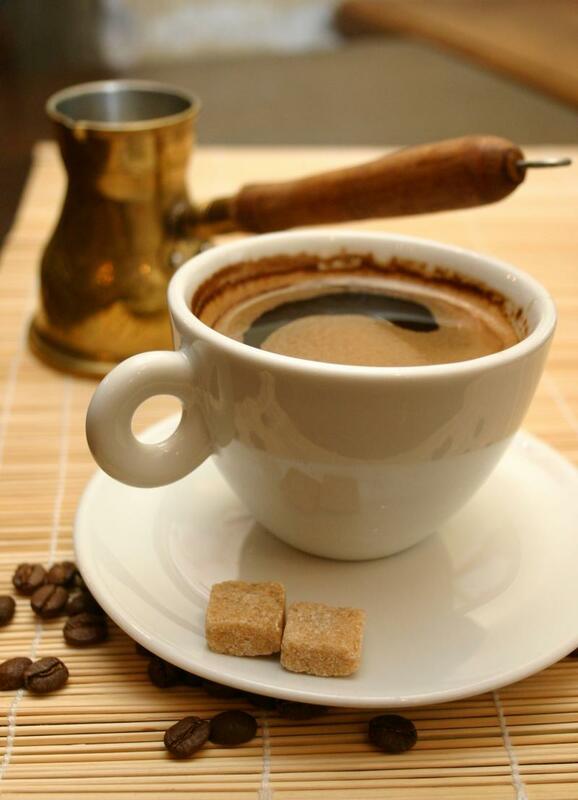 Apart from all these special and cultural characteristics, Greek coffee has something more to offer. Rich in polyphenols and antioxidants as it is and with its moderate content of caffeine, it is supposed to improve cardiovascular health and increase longevity according to a study published in the Vascular Medicine journal performed on the residents of the island of Ikaria in Greece that are known as the people with one of the longest lifespans in the world. "Researchers studying heart health say that a cup of Greek coffee each day may be the key to the longevity of people on the Greek island of Ikaria, who live to age 90 and older." said Dr. Gerasimos Siasos of the University of Athens Medical School in a written statement. It is a fact that people that suffer from side effects of coffee over-consumption are also prompted to drink Greek coffee. But traditional Greek coffee is no longer very fashionable, especially among youngsters. 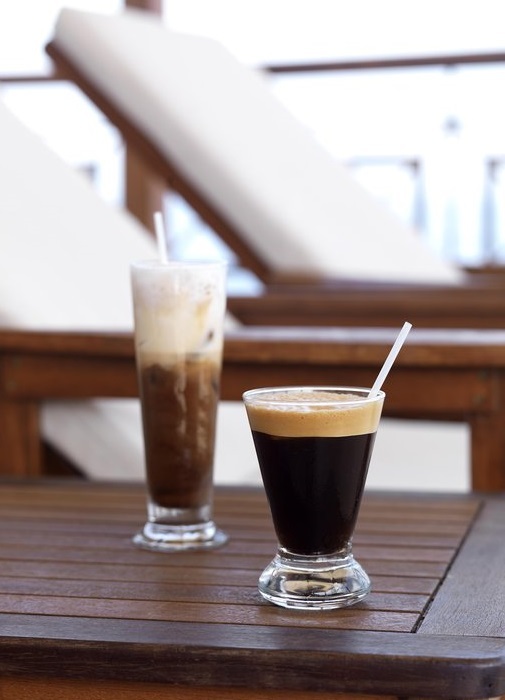 The traditional brew was first undermined by the frappé, an original Greek coffee that took the country by storm in the late '60s and '70s and hasn't let go since, being one of the easiest beverages to make. The word frappé comes from the verb frapper which means to 'hit' in French. However, when describing a drink, the word frappé means chilled. Frappé is a Greek legacy that was accidentally invented in 1957 at the International Trade Fair in Thessaloniki city in Greece. The representative of the Nestlé company, Giannis Dritsas, was exhibiting a new chocolate beverage produced instantly by mixing it with milk and shaking it in a shaker. His employee, Dimitrios Vakondios, couldn't find any hot water in order to have his usual instant coffee during his break. So he improvised by blending the coffee with cold water and ice cubes in a shaker. His creation, Frappé, was since then established as one of the most popular drinks in Greece. By the '80s it was the number one coffee choice in Athens and has become a landmark of the post-war outdoor Greek coffee culture. Today it is available at virtually all Greek cafés and can be ordered with three major degrees of sweetness: glykós (sweet, 2 teaspoons of coffee and 4 teaspoons of sugar); métrios (medium, 2 teaspoons of coffee and 2 teaspoons of sugar); and skétos (plain, 2 teaspoons of coffee and no sugar). When dissolved, the spray-dried instant coffee that is used for frappé, turns into a more stable colloidrelative form than traditionally brewed coffee due to its absence of oil that does not let the bubbles collapse easily. This enables creation of the characteristic thick frothy layer at the top of the coffee similar to crema but more stable. Bubbles come closer together and slowly start to coalesce and create bigger bubbles. The phenomenon continues until the foam almost solidifies, in 2-10 minutes depending on the agitation process. That is why it is not possible to make a good frappé in many countries, without spray-dried coffee. Greek Frappé is also consumed in Cyprus, where the Greek Cypriots adopted the frappé into their culture. The success of frappé led to the birth of many variations, like the addition of vanilla ice cream instead of milk, and to its spreading all over the world. In the '90s, influenced by international trends, Greeks started drinking espresso and cappuccino. Following the footsteps of frappé, came the espresso freddo (iced espresso) and cappuccino freddo (cappuccino with plenty of ice, topped with frothy cold milk) overtaking the frappé as the cold coffees of choice, especially among younger Greeks. These coffees are very popular nowadays and can mainly be found in Greece and Italy. You can also find Frappuccino, an espresso coffee with frothed milk; a portmanteau word of frappé and cappuccino. Don't be surprised to see Frappuccino as well as Greek-style "Frappe" (written by Starbucks without the accent) at Starbucks in Greece, a coffee chain that has conformed to the Greek lifestyle. 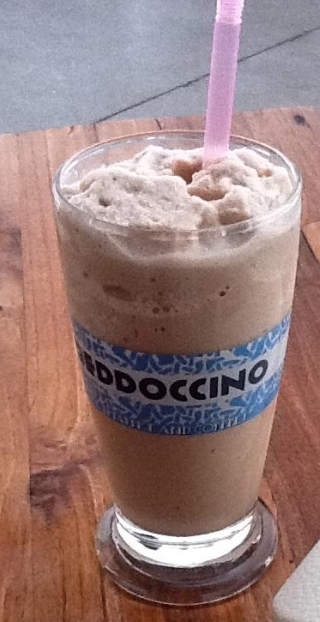 Another interesting case of coffee that has made its way to many cafes' catalogs is Freddoccino, a frozen mix that looks like coffee flavored water-ice, usually consumed during the hot days of the summer. 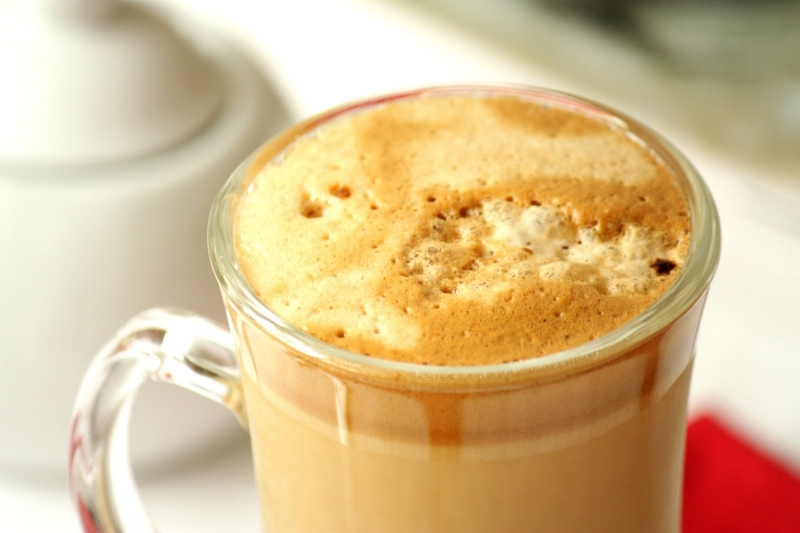 It was invented by a Greek named Kostas Zobanakis during 2002, at a period of increased demand on cold coffee brews. It is more like a coffee milkshake, usually ornate with syrup and/or whipped cream, that is more of a sweet beverage, rather than a stimulant. 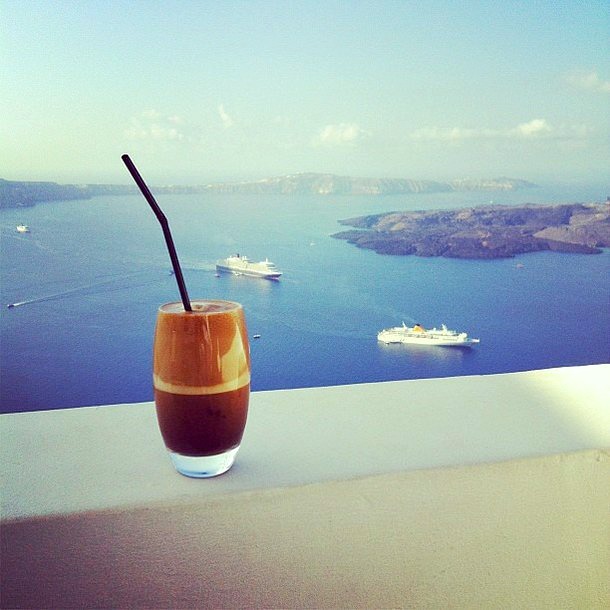 Coffee can also be found in Greece as French press (mainly at hotels) and with modern filter technology. The latter is sometimes known as "Gallikos" (French) which can lead to some confusion with the press method. In case you want filter coffee, it is best to ask straight for it, saying "filtrou". In conclusion, whatever type of cafeteria you stumble on, one thing is for sure. You will certainly find a coffee suitable to your taste. And don't forget to enjoy it the Greek way, otherwise it will be half the pleasure.